Twenty-one years ago, at a friend's request, a Massachusetts professor sketched out a blueprint for nonviolent resistance to repressive regimes. It would go on to be translated, photocopied, and handed from one activist to another, traveling from country to country across the globe: from Iran to Venezuela--where both countries consider Gene Sharp to be an enemy of the state--to Serbia; Afghanistan; Vietnam; the former Soviet Union; China; Nepal; and, more recently and notably, Tunisia, Egypt, Yemen, Libya, and Syria, where it has served as a guiding light of the Arab Spring. This short, pithy, inspiring, and extraordinarily clear guide to overthrowing a dictatorship by nonviolent means lists 198 specific methods to consider, depending on the circumstances: sit-ins, popular nonobedience, selective strikes, withdrawal of bank deposits, revenue refusal, walkouts, silence, and hunger strikes. From Dictatorship to Democracy is the remarkable work that has made the little-known Sharp into the world's most effective and sought-after analyst of resistance to authoritarian regimes. 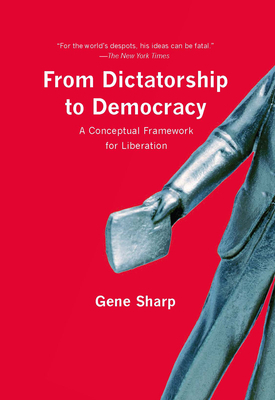 Gene Sharp advises governments and resistance movements around the world and is considered the most influential living promoter of nonviolent resistance to autocratic governments. He is Professor Emeritus of Political Science at the University of Massachusetts, Dartmouth. He currently resides in East Boston.